Most academic writing is pretty dull, but there is one exception: the sociologists know how to write! I don’t know where they learn it from or how they go about it, but there are an astonishing number of sociological studies–not popularizations, but real academic work that is meant to contribute original thought to the field–that are pretty entertaining reads for the laymen. Each of these books is the same. The sociologist identifies a subset of people (for Liebow, for instance, it was homeless women in a DC suburb) and watches them closely for a year or more, then combined their observations, interview notes, and knowledge of sociological theory to draw some grander hypothesis out of what they’ve seen. These books are basically exactly what you want from a juicy nonfiction book: a bunch of interesting characters, finely-observed details, and a larger lesson. 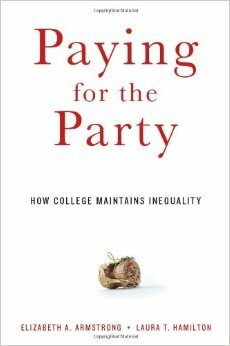 For instance, the one I just read (Paying for the Party by Elizabeth Armstrong and Laura Hamilton) is about the 53 freshman girls who lived on one floor of a ‘party dorm’ at a large midwestern flagship university (I think it’s either UI-Urbana-Champaign or the University of Michigan). The book tracks the students for five years and examines their orientations to party culture and their academic careers through the lens of their social status and their incoming plans (what the book calls their ‘class projects’). For instance, some girls come in wanting upward mobility–they’re working class girls (often the first in their families to go to college) who want to be teachers or nurses. Others–the upper-class and upper-middle-class women–want to replicate their parents’ social station, and they tend to choose one of two paths, either the ‘party’ path or the ‘professional’ path. Really interesting stuff, especially with its analysis how their decisions during freshman year followed them throughout their college career and affected their post-graduation prospects. Much of the book boils down to “If you’re well-off, then you can do whatever you want and basically be okay” but what’s interesting is the ways in which working class and lower-middle-class women are caught unawares. For instance, most of the more studious upper-class and upper-middle-class women don’t draw into this dorm in the first place, because they know it’s where the drunken revels take place. It’s only those who come from families and social circles that don’t have insider information that find themselves unwittingly placed in a dorm where they’re going to have a very difficult time both socially and academically.